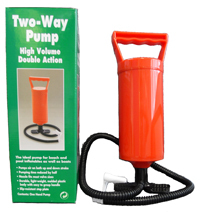 The ideal pump/bellow for pool inflatables or inflatable boats. Comes with a slip-resistant step plate and pumping can be achieved easily with one hand action. Durable and light weight. This pump has nozzles to fit most valve sizes.